Spacious and well-designed, this luxury 2-storey pool house is situated conveniently at the Pines West subdivision. In excess of 2500 square feet, the house sleeps 8 in its 4 upstairs bedrooms, with an additional 2 if required, in the downstairs reception room on a double sofa bed. The master beddroom has a King-sized bed, and en-suite, with separate shower. The second bedroom boasts a queen size double, with bedrooms 3 and 4 furnished with 2 single beds each. 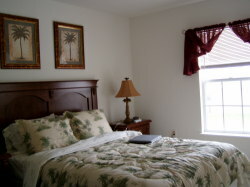 Three of the bedrooms are equipped with TV's and DVD players. Downstairs, the kitchen is fully equipped with electric cooker, dishwasher, microwave, waste-disposal, radio, and American style fridge-freezer. It has oak cupboards and granite counter-tops. 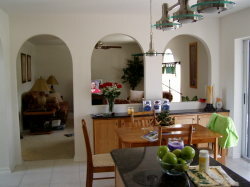 A breakfast table, seating 4, is situated at one end. 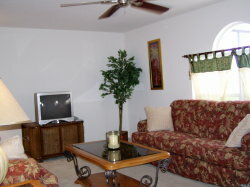 The spacious family room leads from the kitchen with TV/DVD and home theatre. The separate Dining Room seats 8, and there is a further reception room (with sofa-bed etc) with additional TV/DVD. Additionally, the garage boasts a fully-fitted out games room, with a Pool table, table-football and electronic darts. The utility room is fitted with washing machine and tumble dryer. Outside, there is an oversized, south facing pool and patio, fully screened, furnished with tables, chairs and loungers. The pool and pation are illuminated. The gardens are well-stocked, and the pool/patio enjoy largely uninterrupted southern views. This area is well-secluded, and with the privacy screen, is not overlooked. All linen / towels are supplied, with coloured towels for pool use. 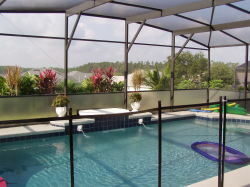 The house is conveniently located off Route 27, less than 5 minutes from the Interstate 4. It is approx. 15 mins to Disney, and 5 mins. to Champions Gate (Golf, supermarket, shops etc.). Further shopping is between 5 and 10 minutes along Route 27. Balance to be paid - 60 days prior to arr to arrival.